For the first part of this adventure, click here. I felt encouraged, as we could not possibly all be wrong. and selected two colors of Hikoo Simplicity inspired by watery locales. Singularly appropriate for a wavy, ripply fabric. The bulk of the knitting would be vivid blue, shot with occasional rounds of dark grey to show off the undulations. It wasn’t bad. Just dull. Predictable. Similar to a dozen lacy collars I’d seen before. A few rounds in a different color wasn’t going to change that. This is adventure? Stripes? Meh. Back to the drawing board. What about working the collar in bold blocks of color, rather like squares on a chess board–but bigger? Bold, solid blocks of different colors in a single piece of knitting are most often created with a technique known as intarsia. If you just shivered, I understand. Intarsia awakens strong feelings in the bosom of the knitter. In the latter part of the twentieth century it was employed, notoriously, to create some of the most misbegotten sweaters the world has ever known. But we must remember that this is not intarsia’s fault. Like any other technique, it can be used for good or ill. The choice is yours. I haven’t the time or space for a comprehensive discussion, but here is a nutshell account. In an intarsia fabric, every discrete area of color requires its own supply of yarn. This drawing shows us a hypothetical piece in green and orange. We are looking at the right side. We begin by knitting across from right to left with the orange yarn. When we reach the point at which a change to green is called for, we twist the old (orange) and new (green) yarns together once to interlock the sections. This interlocking is repeated every time one color gives way to the next, on both sides of the work. Skip the interlocking and you will end up with a fluttering miasma of unattached scraps of fabric, which makes for a very odd, drafty sweater. Only one color is ever active at any given time. Unused colors just hang out, waiting for their turn. This is why elaborate intarsia works-in-progress often grow to resemble mating season in a dark stash closet. There is more to intarsia than this but, frankly, not a whole lot more. Intarsia creates a single-layered fabric with no floats (strands of unused color), ideal for lace. It was clearly the way to go for the collar, but there was an issue. I wanted to work in the round. Intarsia has traditionally been worked flat–even when used to make argyle socks, often considered the apotheosis of the method. This drawing is an aerial view of an attempt at circular intarsia, just starting out. We begin at START HERE and merrily knit our way around, interlocking at the color changes as we go. All is well. and immediately hit a brick wall. We are back at START HERE and need the green yarn. Instead of being where it ought, however, the green is now sitting at the far end of the orange section, utterly ignoring our fevered entreaties to Come Here at Once. If you have cats or teenagers, you know this feeling. I could have surmounted the problem by working the collar as a flat strip and sewing it closed with a seam. This is, in fact, how argyle socks are traditionally finished. I immediately rejected this idea on the grounds that I did not feel like doing that. There is a convoluted, long-standing method for working circular intarsia that I also rejected; because I tried it once and hated it so, so much that after six rounds I grew convinced of the pointlessness of human existence and ate an entire chocolate cheesecake in the bathtub while listening to a worn out mix tape of The Smiths given to me by the college boyfriend who broke my heart. This might have meant a radical reconfiguration of the design were it not for a fairly recent innovation in intarsia, conceived by intarsia master Anne Berk. Anne feels about intarsia the way I feel about shadow knitting–that it’s a good egg, really, and just needs some love and understanding. She tackled the thorny issue of working this stuff in the round without recourse to cheesecake, and compiled the results in this book, Annetarsia Knits: A New Link to Intarsia. Her solution is so simple, yet so marvelously effective, that when I read it I grew absolutely furious that I hadn’t thought it up myself. That’s probably for the best, as nobody would want to buy a book called Franklintarsia. In particular Anne’s way of dealing with the beginning of the rounds, which present special problems, is so perfect it makes me giddy. I couldn’t remember exactly what she does and didn’t have my book handy when the collar began, so I bunted. My result is below. Anne’s is above. Hers wins, obviously. What with it being perfect and all. And so the collar was worked in fits and starts on four airplanes and a ship, yet popped off the needle almost before I knew what was happening. So pleasant. …but didn’t need to pin them. This collar began with the Wheat-ear pattern, so I’m calling it “Frumentum,” the Latin for “grain.” If you’d like to make one, here’s what to do. Two balls each of two colors Hikoo Simplicity. I used Seattle Sky (C1) and Fijian Waters (C2). A circular needle size US 4/3.5mm, or the size you need to achieve a gauge you like. Maximum cable length will be 24 inches, but shorter will likely be more comfortable. I used my beloved Addi Short Lace Clicks with a 16-inch cable. A copy of Annetarsia Knits, or instruction in the method through one of Anne’s classes. I can’t present it to you here, alas, but both Anne and her book are readily available everywhere these days. Wind all four skeins of Simplicity into balls; you’ll have them all in play at one time once the intarsia begins. With C1, cast on 136 sts using the method of your choice. Join to work in the round, taking care not to twist. Place marker to indicate beginning of round. With C1, work 2 repeats of Round 1 of the revised Wheat-ear chart (see below) across the first 34 sts. Join the first ball of C2 and work 2 repeats of Round 1 on the next 34 sts. Follow this with a 2 more repeats in C1, joining the second ball of that color; and then begin 2 more repeats of C2, ditto. You should now be at the beginning of the round, with all four balls of yarn attached to the work. Work the entire Wheat-ear Pattern chart through Round 16, interlocking sections and rounds using Anne Berk’s circular intarsia method. When the chart is complete, break the working yarns, leaving 8-inch tails. Work a second full repeat of the chart, alternating the colors of the sections (grey atop blue, and vice versa). When complete, break working yarns. Work a third repeat of the chart through Round 8 only, once again alternating the colors of the sections. Break working yarn and weave in ends. Soak and gently block on flat surface, shaping top and bottom points into even scallops. Allow to dry completely before wearing. No, wait. Wait. I don’t think I’m quite finished with this yet. See you in two weeks. Hikoo Simplicity (55% Merino Superwash, 28% Acrylic, 17% Nylon, 117 yards per 50 gram hank). Colors: Fijian Waters (Blue) and Seattle Sky (Grey). addi® Click Interchangeable needles, size US 4/3.5mm. Annetarsia Knits: A New Link to Intarsia by Anne Berk (Double Vision Press, 2014). Designer, teacher, author and illustrator Franklin Habit is the author of It Itches: A Stash of Knitting Cartoons (Interweave Press, 2008). His next book, I Dream of Yarn: A Knit and Crochet Coloring Book will be published by Soho Publishing in June 2016. He is the longtime proprietor of The Panopticon, one of the most popular knitting blogs on the Internet. On an average day, upwards of 2,500 readers worldwide drop in for a mix of essays, cartoons, and the continuing adventures of Dolores the Sheep. Franklin’s varied experience in the fiber world includes contributions of writing and design to Vogue Knitting, Yarn Market News, Interweave Knits, Interweave Crochet, PieceWork, Twist Collective; and a regular columns and cartoons for Knitty.com, PLY Magazine, Lion Brand Yarns, and Skacel Collection. Many of his independently published designs are available via Ravelry.com. He travels constantly to teach knitters at shops and guilds across the country and internationally; and has been a popular member of the faculties of such festivals as Vogue Knitting Live!, STITCHES Events, Squam Arts Workshops, Sock Summit, and the Madrona Fiber Arts Winter Retreat. Franklin lives in Chicago, Illinois, cohabiting shamelessly with 15,000 books, a Schacht spinning wheel, two looms, and a colony of yarn that multiplies whenever his back is turned. Spotted On Ravelry – Swish! 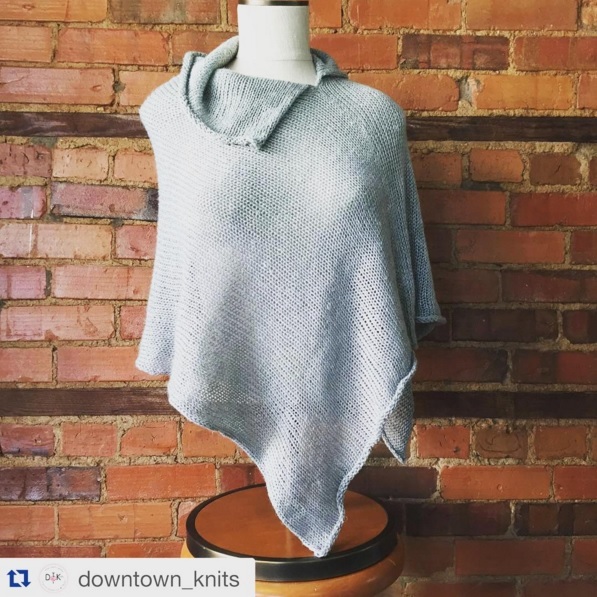 This issue brings an on-trend poncho that’s great for social knitting. 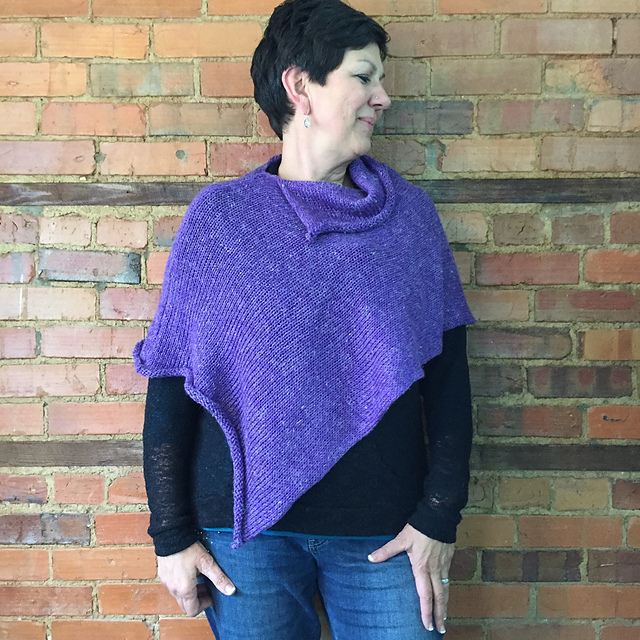 Introducing Swish by Andrea Caruolo using Hikoo® Rylie! The bias drape on this piece is flattering on every shape. It’s a breeze to knit and Hikoo® Rylie blocks like a dream, which is a must with so much stockinette stitch that naturally loves to curl. Purchase this pattern for $6.00 on Ravelry. How about a little something for the kids? If you’ve ever tried to find a pattern for a child (not a baby) you know that the selection is not vast. There are certain designers out there who thankfully excel at this, but still not the range you can find in let’s say…shawls or women’s cardigans. This pullover come in 6 sizes: 2yr (4, 6, 8, 10, 12); Sample shown in size 2. Mackenzie also was nice enough to put together several alternate color combos on her blog. Clearly this is a garment to be made more than once because who can pick a favorite from those colors? For all the details and to purchase the Mountaintop Pullover, check out the Ravelry page! You can also follow Mackenzie on Instagram. When I have the luxury of knitting without a deadline, one of my favorite things to do is knit swatches. I admit that I have odd ideas about what constitutes a good time. Most knitters I have met say they would prefer to give a cat a bikini wax rather than knit a swatch. I, however, have learned most of what I know about yarn by turning out hundreds and hundreds of itty bitty scraps of fabric. Sometimes I knit swatches for mundane reasons: to check gauge, test drape, or plan a design. Other times, as in this adventure, I knit them just to see what happens. I get a kick out of that. And in the long run, it’s productive. Just as most of my best ideas for cartoons bubble up after hours of aimless doodling, so my best knitting designs follow miles and miles of stitching with no special goal in mind. I have a particular goofy passion for working from nineteenth century patterns. I won’t go into all the reasons why here; but chief among them is the mystery. It’s not uncommon for pattern books from the 1840s through the 1890s to offer you either only a rudimentary or misleading illustration of what you’re making, or–most often–no illustration at all. You get a rather bald title–“For a Gent’s Patterned Glove, with Fingers” and that’s it. To work from these is to participate in the original mystery knit-alongs. I’d been wanting to play with The Lady’s Knitting-Book (1878) for some time. The author, credited on the title page only as E.M.C., has been revealed as Elvina M. Corbould. She was quite prolific. For this adventure, we’ll dip into the second series of The Lady’s Knitting-Book, which ran to at least four volumes; she also produced (or at least put her initials upon) multiple works on crochet, netting, and needlework. One of the things I like about Elvina’s knitting books is that she is liberal in her dispensation of stitch motifs. I wasn’t in the mood to knit a Whole Thing, just little bits. If one of those little bits were to give me a bigger idea, I could see about turning it into a project. and chose three, based entirely on how interesting their names were. First up was “Talisman Pattern,” because how on earth can you not be curious about something that calls itself that? It revealed itself to be a variation of basket weave. Hmm. Well, okay. A perfectly nice variation, but not something I felt like doing more of. Not now, anyway. This was intriguing because it was short–just three rows–and appeared to be lacy, as the instruction to “wool forward” (meaning yarn over, an instruction still to be found in some British publications) was frequent. The result was extremely interesting: a fully reversible fabric displaying the characteristics of lace and those of ribbing. Definitely worth another look. Here, if you would like to try it yourself, is the chart. And then “Wheat-ear Pattern,” the most elaborate (or at least the longest) of the three. This was a motif to explore further. After a few repeats I found I wanted to knit a bunch more, which is always a good sign. Of the three I tried, this was the only one of Elvina’s patterns to include errors. I’ve corrected them for the chart. Now, what to do with it? I have an idea. See you in two weeks. Hikoo® Simplicity (55% Merino Superwash, 28% Acrylic, 17% Nylon, 117 yards per 50 gram hank). Colors: 013 Violette (Talisman), 026 Pale Yellow (Lorne), 036 Silver Hair (Wheat Ear). Pages from The Lady’s Knitting-Book, Second Series by Elvina M. Corbould. Available in digital form here from the University of Southampton, as part of the Richard Rutt Collection. Baby season is approaching rapidly. Are you prepared with little knitted gifts on hand? We have one to keep in your back pocket that has both girl AND boy versions! Meet the Oliver & Olivia Baby Cardigan by Sharon Watterson. This boxy little cardigan has sweet 3-button detailing that wont over-complicate getting your little one into it. Plus, with so much stockinette up for grabs, a little duplicate stitching around the hem in the recipients initials would be a quick and easy way to personalize this garment. Depending on the size you choose to make, 3-4 balls (300-400 yds) of Hikoo® Llamor is all you’ll need! It’s the perfect excuse to work with one of our newer yarns, Hikoo® Llamor! It’s a super soft 100% Baby Llama available in neutrals, muted and bright colors. Purchase your copy of this pattern for just $5.95 via Ravelry!